29 October 2017 Making Cannabutter. http://durgan.org/2017/October%202017/29%20October%202017%20Making%20Cannabutter/HTML/ 29 October 2017 Making Cannabutter. Cannabutter is the final step to produce edibles. It can be a tedious procedure, I have tried to simplify by using the double boiler method after decarboxylation. Eliminating the trimming reduces a lot of diddling. After the cannabutter has been double boiled for about three hours the process is essentially finished. The solids can be strained or ingested. A teaspoon is about an initial dosage. 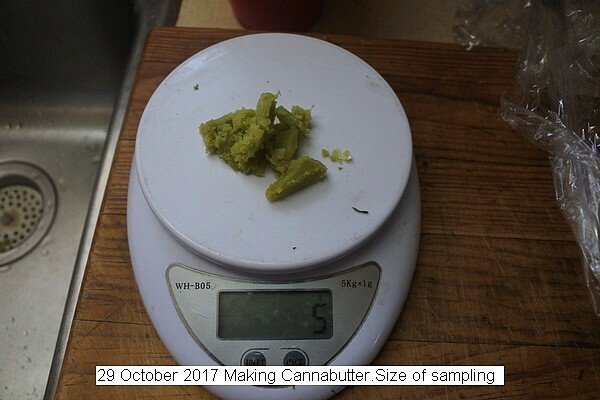 This entry was posted in Uncategorized and tagged 29 October 2017 Making Cannabutter., Making Cannabutter using double boiler, Making Cannabutter.. Bookmark the permalink.